Over the last 30 years, reactor safety technology has evolved not so much from a need to recover from accidents or incidents, but primarily from many groups in the nuclear community asking hypothetical, searching (what if) questions. This questioning has indeed paid off in establishing preventive measures for many types of events and potential accidents. Conditions, such as reactivity excursions, large break, loss of coolant, core melt, and containment integrity loss, to name a few, were all at one time topics of protracted discussions on hypothesized events. Historically, many of these have become multiyear, large-scale research programs aimed at resolving the "what ifs". For the topic of anticipated and abnormal plant transients, how­ever, the searching questions and the research were not so prolific until the mid-1970s. At that time, probabilistic risk methodologies began to tell us we should change our emphasis in reactor safety research and development and focus more on small pipe breaks and plant transients. Three Mile Island punctuated that message in 1979. 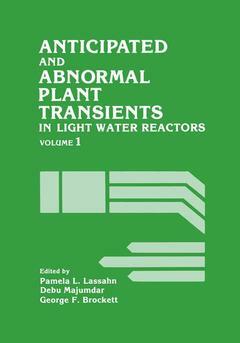 The plant transient topic area is a multidisciplinary subject involving not only the nuclear, fluid flow, and heat transfer technologies, but also the synergistics of these with the reactor control systems, the safety systems, operator actions, maintenance and even management and the economic considerations of a given plant.